A new music ensemble for the 21st Century, the [Switch~ Ensemble] is dedicated to the creation and performance of new works for chamber ensemble and real-time interactive computer processing. 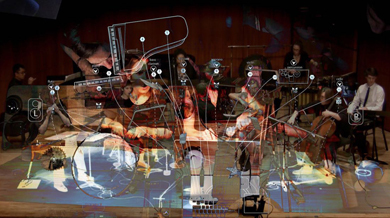 These projects often require technological integration that is atypical of the current structural and organizational paradigms of new music ensembles. This necessitates direct collaboration with composers, improvisers, and sound artists throughout their creative process, optimized for needs that differ radically from the creation and rehearsal of acoustic music and allowing for perpetual experimentation and refinement. We believe that working directly with composers in a medium that is often not fully notated, the score becomes a departure point rather than an ideal to be adhered to, allowing for new and exciting musical and dramaturgical situations to arise in live performance. Josh Levine: Sixty cycles for solo cello.